While more and more vegan options are popping up in the Santa Barbara food scene, they can now be found in a very unsuspecting place: the school cafeteria. “The kids are eating it up,” said Nancy Weiss, food director for the S.B. Unified School District, which now offers a range of vegan alternatives as part of a wide effort to serve students healthier, more sustainable foods. A key component of this shift is Hungry Planet, a family-owned company that makes plant-based meat alternatives. Weiss was introduced to the products by cofounder Jody Boyman, who has two kids in Santa Barbara High’s MAD Academy. “One bite, and I was like, ‘Wow, I’m sold!’” said Weiss. And she’s not alone — Hungry Planet’s burgers, sausages, and other products are finding their way into top restaurants around town as well. Last year, the district and Hungry Planet partnered up for Earth Day to serve 100 percent vegan meatball subs, chicken chile verde burritos, and double cheeseburgers from their food truck. Sales tripled over previous years, and they sold out both days. Taking that as a sign, Weiss began offering vegan meals for kids at the school cafeterias on a call-ahead basis. That started this past January, and now 50 percent of the meals at S.B. Unified schools are vegan. March’s Hungry Planet options, for instance, included soyrizo quesadillas, crispy chicken burgers, spaghetti and meatballs, beef nachos, and chicken alfredo. “A lot of days they are running out of the Hungry Planet option,” boasted Weiss, who’s proud to see more students embrace veganism and vegetarianism. Hungry Planet foods are a good tool for that shift because they’re developed to look and taste like real meats. Brother-sister cofounders Todd and Jody Boyman spent more than a decade researching and developing their products before launching their coast-to-coast pilot project in 2017. But Hungry Planet does more than meatless burgers and ground beef. There are plant-based chicken, sausage, chorizo, and even crab-cake alternatives, all of which are made with non-GMO soy and contain much fewer calories and much less fat than meat. And because they can be used as a 1:1 substitute in any recipe that calls for meat, chefs have been very receptive to adopting them in their favorite recipes. 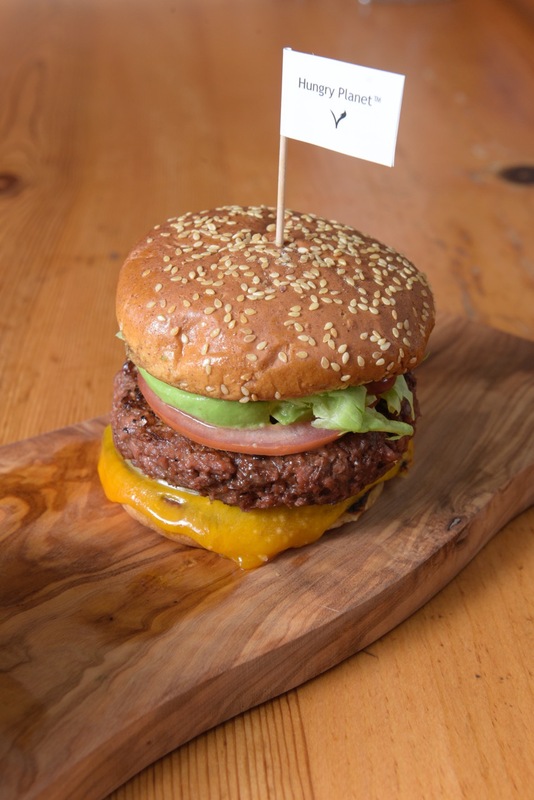 Hungry Planet is now being served by a variety of kitchens across Santa Barbara, from white tablecloth (Lucky’s Steakhouse’s $22 Vegan Burger) to casual seaside dining (Padaro Beach Grill’s $10.25 Range Free Vegan Burger) to campuses (UCSB Soup Guy’s daily vegan soup offerings often feature Hungry Planet Italian sausage). “Not a week goes by that we don’t get a call from a university saying, ‘How can we get our hands on your food, because our students are demanding it?’” said Todd. But it’s not just the super-health-conscious vegans who are seeking out meat alternatives. “There’s an enormous cohort of individuals who at least want to eat healthier on occasion,” said Todd. 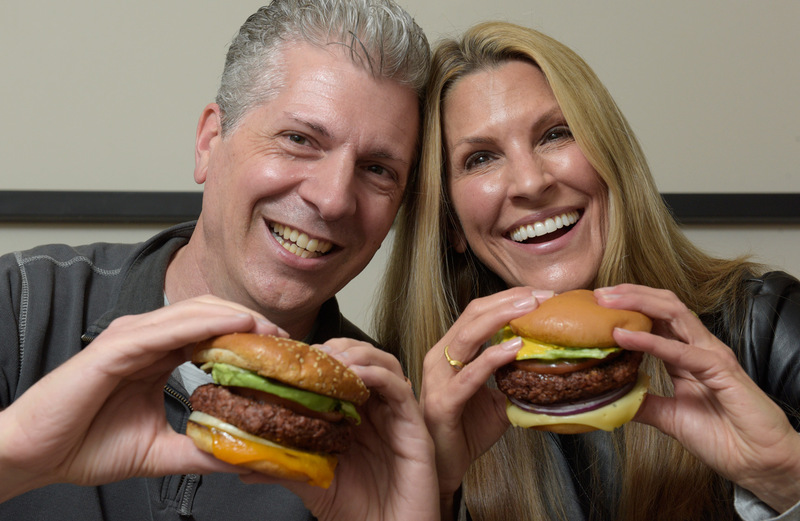 Hungry Planet will officially launch this year, and the Boymans are prepared to make their food available nationwide, not only in schools and restaurants, but also on the retail level with special entrées that they have created. They feel that the broader market is finally ready for more vegan options.